This is one of my hockey-knitting projects. Because this pattern has both cables and lots and lots of twisted stitches, and because I’m knitting it on US #1/2.25 mm needles, it’s a slow go. These socks will probably take forever and a day. Stitches are twisted by knitting the stitch through the back loop rather than the front loop, and it takes me a bit longer to knit a stitch that way. It’s also a little hard on my hands to knit the twisted stitches, so I can knit on the sock for only a couple of pattern repeats at a time. 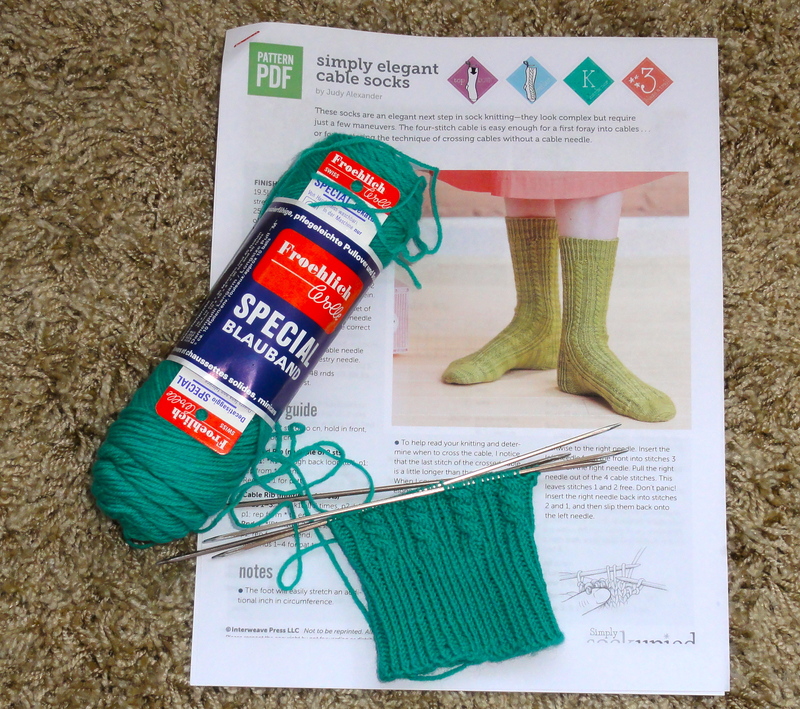 But the pattern, the Simple Elegant Cable Socks by Judy Alexander published in Simply Sockupied 2012 (also available on Ravelry as a download), is so lovely, it’s worth the extra effort. Judy, from TheKnitter.com, is one of my favorite sock designers; her designs are well-thought-out with great attention to detail. This entry was posted in Knitting, Socks and tagged Froehlich Wolle Special Blauband, hand knitted socks, Judy Alexander, knitting and hockey, Simply Elegant Cable Socks. Bookmark the permalink. It looks like a lovely pattern to be sure! Kudos also for working cables with twisted stitches … I have tried this twice so far, but it takes AGES to knit one round, so right now, I don’t have the patience for that ….